November 26, 2011 - On Wednesday a twin-engine Rockwell 690A twin turboprop aircraft, tail number N690SM, had its fuel tanks topped off at its home base Safford Regional Airport (SAD), Safford Arizona. The aircraft departed with its pilot Shawn Perry, 39, copilot Russell Hardy, 31, who is the owner of the aircraft and Ponderosa Aviation, and the company’s mechanic Joseph Hardwick, 22. The aircraft landed at Falcon Field, Arizona where Perry who is divorced picked up his three kids Morgan Perry, 9, Logan Perry, 8, and Luke Perry, 6, to have a Thanksgiving weekend together. The aircraft departed Falcon Field at 6:15 PM to return back to its home base. At or about 6:31 PM the twin-engine Rockwell crashed into the side of Superstition Mountains at Flat Iron, the southwestern portion of the mountain chain which is 40 miles east of Phoenix. It is believed that the twin-engine airplane was traveling at 200 mph when it slammed into the mountain ridge. The Superstition Mountains, highest point 5,057 MSL, is a popular recreation destination for residents of Phoenix. The aircraft exploded into a ball of fire that was visible for miles. The twin-engine aircraft split apart and burning debris scattered for some distance. All onboard died in the crash. "No one could have survived that crash," said Pinal County Sheriff Paul Babeu. Hardwick was planning to get married on December 16th. Late Wednesday the mother of the deceased children was notified of the accident and the death of her children. Sheriff Babeu said, "This is their entire family it's terrible. Our hearts go out to the mom and the (families) of all the crash victims. We've had so many people that are working this day, and we just want to support them and embrace them and try to bring closure to this tragedy." By a twist of fate, a search and rescue team was in the mountains searching for three missing teenagers Wednesday evening and saw the explosion, Sheriff Babeu reported. 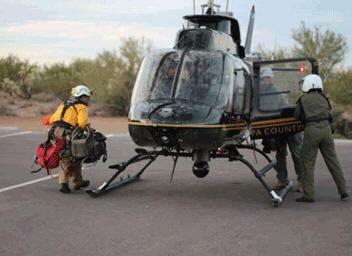 The searchers located the teens and then went up the mountain to the crash site. At this time there is no clear answer as to the cause of the crash. However Sheriff Babeu said there was no indication the plane was in distress or that the pilot had radioed controllers about any problem. The Federal Aviation Administration and the National Transportation Safety Board arrived at the crash site on Thursday.